Description: Astrophytum asterias var. nudum (a.k.a. cv. Ruri Kabuto) has a very characteristic glabrous stem lacking the white tufts of loose hairy scales typical of the common Astrophytum asterias. Crested form: The crested form (Astrophytum asterias var. nudum f. cristata) - despite to its beauty - is very rare and sought after by collectors, for its unique features remembering of Lophophora williamsii var. cristata. 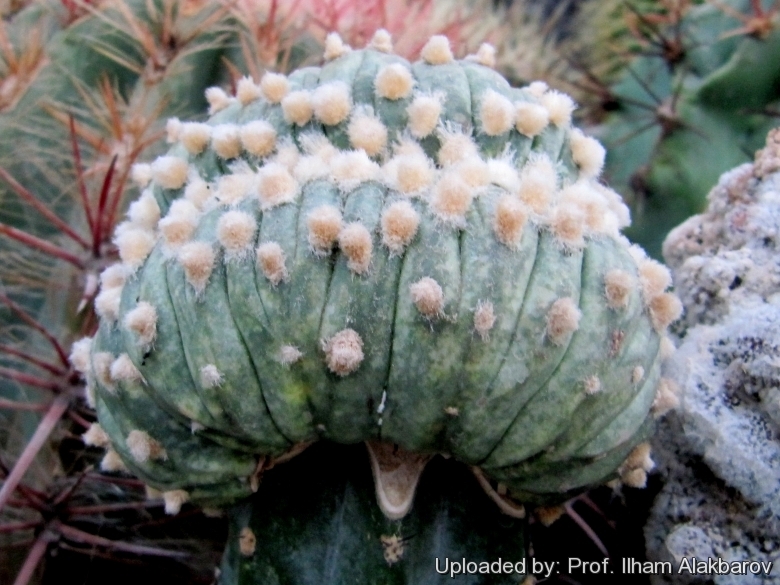 It is a small low growing crested cactus that will slowly forms tangled groups up to 30 cm (or more ) in diameter with age. The plant tends to grow seated in substrate, but in cultivation it is almost always seen grafted on columnar cacti. There are several crested clones mainly selected by Asian growers. Stem: Green, grey-green to dark olive green, much depressed, fan-shaped mature plants 2-7 cm tall, 5-16 cm broad, smooth completely flake free (without the minuscule tufts of bright white hairy scales). Ribs: The stem is typically divided by very narrow but distinct vertical grooves into 8 broad ribs. The ribs are very low, almost flat on top, forming triangular sections with no cross-grooves. Propagation Grafting.or cuttings. Plants are usually grafted onto column-shaped cacti but proved to be able to produce their own roots if degrafted.